Restaurants and retailers show their thanks and support to Veteran’s on Veteran’s Day every year, with some great freebies, deals and discounts! Here’s a list of some of the freebies and discounts we’ve seen available on Friday, November 11th! We want to say a big, “THANK YOU” to all service members and veterans. 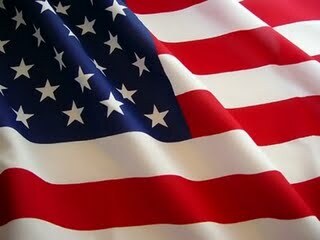 Your service and sacrifices are admirable and amazing! Car wash operators across the country are providing FREE car washes on Friday, Nov. 11. See the complete list of participating companies here. National Parks - FREE access to National parks (for everyone) on Friday, Nov. 11. On Veterans Day, customers who come in for a haircut at any U.S. Great Clips salon will receive a free haircut card to give to an active/inactive/retired military member of any branch, including the National Guard. Veterans can also visit any U.S. Great Clips salon on November 11 to get either a free haircut that day or to pick up a free haircut card to use later. Many Sport Clips locations will also offer free haircuts to active-duty U.S. service members and veterans on Veterans Day, Friday, November 11, 2016, with valid proof of service. *Verify with your local Sports Clips to see if they are participating. Oil changes are free to Veterans and active duty armed forces members at many participating local oil change centers including participating name brand oil service centers. Call stores in your local area to confirm. Many are offering the free oil change for several days around Veterans Day. For example, This Veterans Day, November 11, 2016, all veterans and active duty will receive a free Basic Oil Change* at participating Meineke locations. *GameStop has partnered with the Call of Duty Endowment and Snowball Express to raise in-store donations to help support U.S. military veterans and the children and families of America’s fallen military heroes. From October 21 to November 15, GameStop will invite customers to show their support of our veterans and their families by donating $1, $5 or $10 at the point-of-purchase. PowerUp Rewards members who donate $1 or more will receive triple reward points on the donation amount. This is GameStop’s first time to conduct an in-store and online donation campaign to benefit the Call of Duty Endowment and Snowball Express. All donations will be equally distributed between the two charities. JC Penney - All current and former military personnel can enjoy discounts off purchases on Veterans Day. Lowes Home Improvement - Lowes honors all Veterans on three specific holidays: Memorial Day, 4th of July and Veterans Day. During these three holiday weekends, Lowes extends the discount to all veterans who served honorably and who present a valid Form DD214 or other proof of service. Walgreens - Offering a 20% discount to all Veterans, Active duty military, and their immediate families, on Veterans Day 2016. Must present a Walgreens Rewards card and valid Military ID or proof of service to receive discount on eligible items. *Applebee’s - Veterans enjoy a FREE Signature Entree on Friday, Nov. 11. *California Pizza Kitchen - FREE pizza, pasta or salad for vets and active duty military on Nov. 11 with proof of service or uniform. *Chipotle - Friday, November 11th from 3PM-Close, Chipotle is offering members with a U.S. Military ID to a Buy 1 Get 1 Free Burrito, Bowl, Salad or Order of Tacos. Valid for all U.S. Military (Active Duty, Reserves, National Guard, and Retired Military), Military Spouses with ID and Veterans. *Denny’s is inviting active, inactive and retired military personnel to stop by for a free Build Your Own Grand Slam® on Friday, Nov. 11, from 5 a.m. to noon. At participating locations nationwide, diners with a valid military ID will receive a complimentary Build Your Own Grand Slam®, which includes four delicious breakfast items such as new fluffy Buttermilk Pancakes, eggs cooked to order, sizzling bacon strips, seasonal fruit or hash browns. *Famous Dave’s - FREE Meal (from a special menu) for former and current military personnel on Friday, Nov. 11. 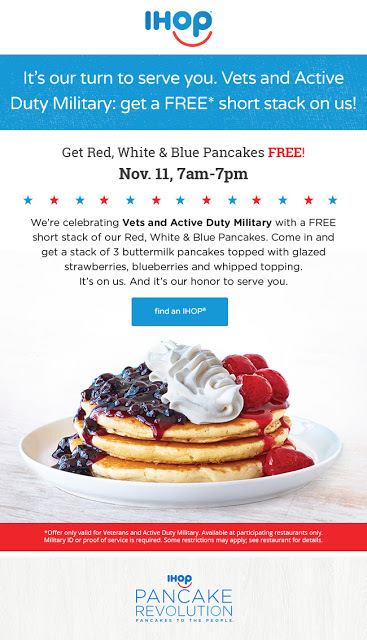 *Golden Corral - FREE Meal for veterans and active duty on Monday, Nov. 14 between 5 p.m. and 9 p.m.
*IHOP - Veteran’s day is Friday, November 11th and IHOP is celebrating with a FREE Short Stack for Vets and Active Duty Military! More info HERE! FREE entrée (sandwich, hot dish or entrée salad up to $9.99) for active duty, reserve or retired service members. Offer valid Nov. 7 – 11, 2016. 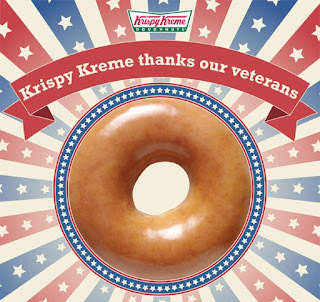 *Krsipy Kreme - FREE doughnut and small coffee for veterans at participating locations on Friday Nov 11. No ID is required. *McCormick & Schmick’s - FREE meal (from a special menu) for Veterans on Sunday, Nov. 6. Must have proof of service. *Olive Garden - November 11th, all active duty military and veterans that go to Olive Garden get a free entree of choice from the limited menu plus unlimited soup, salad and breadsticks when you show a Military ID. 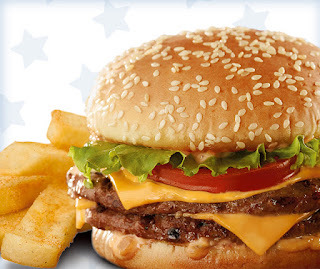 *Red Robin - FREE Tavern Double Burger and Bottomless Steak Fries for Veterans and Active Duty Military on Nov 11. No purchase necessary. *Ruby Tuesday - All veterans, active duty and reserve military service members with valid military ID can enjoy one free appetizer (up to a $10 value) on Veteran’s Day (Nov. 11). Offer is valid at all Ruby Tuesday locations, excluding those in Guam, Hawaii, Manhattan, airports or outside of the United States. *Texas Roadhouse - Texas Roadhouse is offering Veterans & Active Duty Military a totally free lunch – NO purchase necessary! There are 10 different menu items to choose from, plus you get a beverage of your choice. *White Castle - Free Breakfast or Castle Combo for any Veteran or Active Duty Military. Limited time only. At participating Castles. Offer valid on 11/11/16 only. Not valid with online orders. Limit one combo per customer. If possible, please show proof of military service.